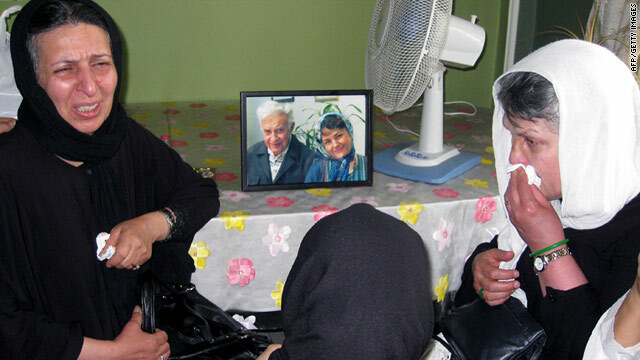 Relatives mourn next to a photo of Iranian opposition figure Ezatollah Sahabi and his daughter Haleh Sahabi. Washington (CNN) -- The State Department called on the government of Iran Wednesday to investigate the death of a human rights activist this week, reportedly after security forces got into a confrontation with mourners at her father's funeral. Haleh Sahabi, an opposition activist and women's rights advocate, was arrested during Iran's 2009 post-election crackdown and was given a two-year jail sentence. She was allowed out of prison to attend the funeral of her father, noted Iranian dissident Ezatollah Sahabi. According to opposition websites, Sahabi was pushed to the ground during a scuffle between mourners and security forces and died of cardiac arrest. She was in her mid-50s. The opposition web site Kaleme said that security forces tried to interfere with the carrying of the body, confronting Sahabi and other mourners. She was clutching a photo of her father to her chest and fell when the security forces tried to take it from her, Kaleme reported. Another opposition site, Sahamnews, said one of the security forces punched her in the abdomen. "Both Haleh and her father suffered in life for their political activism including imprisonment," deputy State Department spokesman Mark Toner said. "We call on the Iranian government to investigate the circumstances of her death. If reports are accurate that government security forces contributed to her death, this would demonstrate a deplorable disregard for human dignity and respect on the part of the Iranian authorities." Toner questioned the presence of security forces at the funeral and said the initial reports that Sahabi's death was related to the scuffle between the mourners and the security forces need explaining. "Why Iranian security forces would have been at this event is question number one, and question number two is whether there was some kind of physical altercation that caused her to suffer," he said. Semi-official news agencies like Mehr and Fars said that Sahabi had not died at the hands of security forces, but rather due to a pre-existing heart condition. Sahabi's death comes just two weeks before the June 12 anniversary of the 2009 Iranian election, in which the re-election of President Mahmoud Ahmadinejad angered supporters of Iran's opposition movement and sparked massive protests that were followed by a crackdown by the Iranian government. The Obama administration has increased pressure on the Iranian regime over alleged human rights violations, imposing sanctions recently on individuals believed to be responsible for violence against the opposition.